As darkness falls on August 20 to 22, 2018, watch for the waxing gibbous moon to move by two of the four planets now up after sunset. The moon passed Venus around August 13 and 14. It passed Jupiter around August 16 and 17. On August 20 and 21, the moon passed nearest the planet Saturn, and, by August 22, it’s moving toward the red planet Mars. The moon travels about 1/2 degree (its own angular diameter) eastward per hour relative to the backdrop stars and planets of the zodiac. This motion is, of course, the moon’s true motion in orbit around Earth. It so happens that August 2018 is an exceptional month for viewing and/or identifying bright planets. Don’t miss the moon in the coming nights! View larger. | Here’s the moon at the beginning of its trek past the 4 planets in the evening sky – on August 13, 2018 – as captured from North Carolina by our friend Ken Christison. Also … notice the meteor in the annual Perseid meteor shower! The planet to the immediate left of the moon in this shot is Venus. On the far left of the photo is Mars. Jupiter is the 3rd brightest planets (above the bright lights on the horizon). Saturn is tougher to see … but it’s there, set against the background of the Milky Way. Also see the photo below. View larger. | Milky Way and 4 planets in the evening sky. 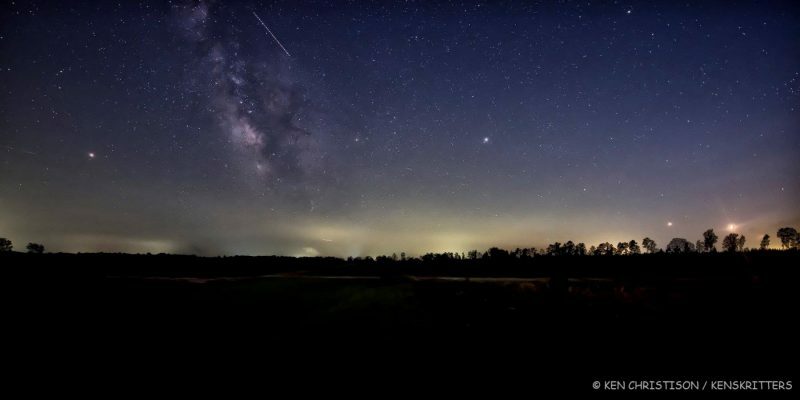 Michael Seeley was in Florida’s Bull Creek Wildlife Management Area when he created this panorama of planets and Milky Way on August 3, 2018. The moon goes full circle through the constellations of the zodiac every 27 1/3 days. 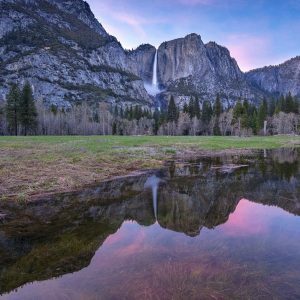 This sort of month is called the sidereal month – one revolution of the moon relative to the backdrop stars. In contrast, a lunar month (sometimes called a lunation or synodic month) is the time between successive returns to the same lunar phase, a period of about 29 1/2 days. Although the moon goes by all the stars and planets of the zodiac every month, it rarely has such a month as this, when four bright planets can be seen arrayed so beautifully across the sky. 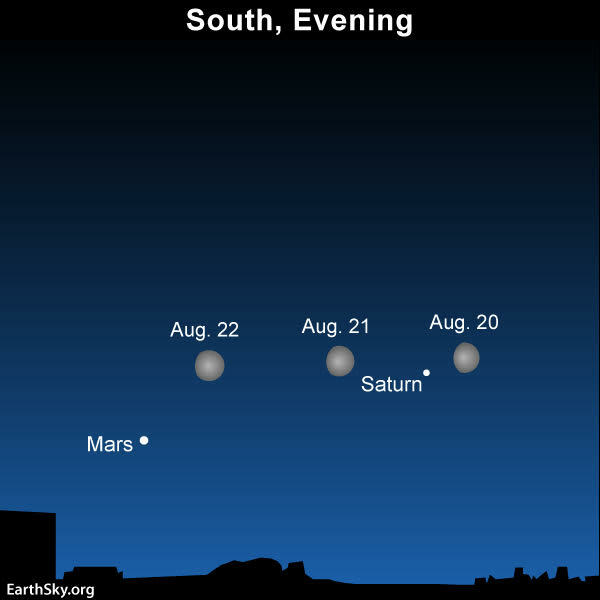 Watch for the moon and Mars on August 23, too. Read more about this image. Plus Mars is still at its brightest. Earth and Mars are still so close together now (Earth having passed between Mars and the sun on July 27, 2018) that you won’t need the moon to help you identify it. Mars is bright! It’s red! You can’t miss it. It’s still the fourth-brightest celestial object, surpassed only by the sun, moon and Venus. It’ll remain brighter than Jupiter through early September. The moon’s phase will be somewhat smaller when the moon passes Saturn and Mars in September. And the month following will find the moon’s phase smaller yet when it meets up with Saturn and Mars in October. This happens because the sidereal month is some two days shorter than the lunar month. 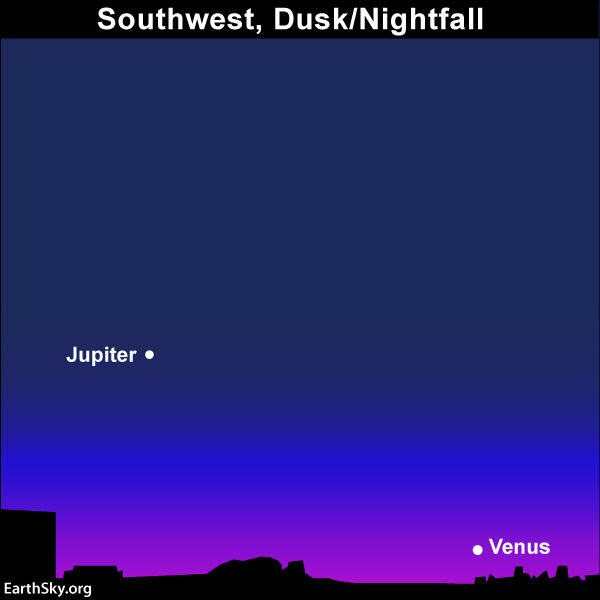 Venus and Jupiter, by the way, are the brightest “stars” to light up the western half of your sky every evening. They pop out almost immediately after sunset. If you live at mid-northern latitudes, be sure to look for Venus fairly soon after sunset. Venus sets around nightfall from this part of the world; fortunately for the Southern Hemisphere, Venus stays out for a few hours after dark. 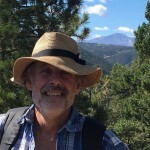 Bottom line: Saturn is considered a bright planet, but it’s the faintest of the four evening planets which arc across the sky from west to east in this order: Venus, Jupiter, Saturn and Mars. 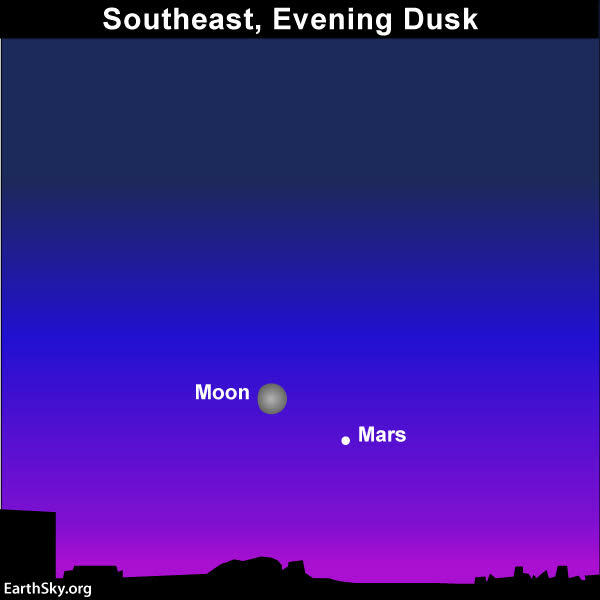 See Mars close to the moon on August 22, it’s still plenty bright!